Gus Malzahn and the Auburn Tigers barely escaped an upset bid by Jacksonville State. AUBURN: The scare the Tigers got against Jacksonville State on Saturday, needing overtime to pull out a 27-20 win as (-39) favorite has cost Auburn a lot of stock nationally. 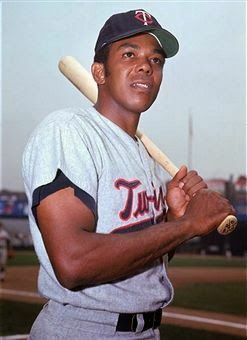 In fact, the Tigers have been overpriced lately anyway. What do I mean by lately? Like ever since they finished off the 2013 national championship game, a cover against Florida State. 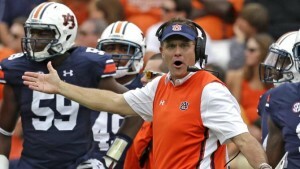 Last season, Auburn was priced like a national championship contender and couldn’t meet that bar. The Tigers were 4-8 against the number and now they’ve started 0-2 ATS this season, even while winning both games outright. I’m willing to give Gus Malzahn’s team a pass for the Jacksonville State near-disaster. It was right in between the season opener against Louisville in the Georgia Dome and the LSU game on Saturday, the proverbial “sandwich” spot. My concerns lie with what happened in the Louisville game itself. Auburn jumped out to a 24-0 lead and then had to hold off a late Cardinal charge to hold on 31-24. Louisville is an extremely young team and the Tigers failed to cover the (-10) line. They had serious problems defending Louisville’s versatile quarterback Lamar Jackson, who ran for 106 yards. Auburn’s own quarterback, Jeremy Johnson, threw three interceptions. That’s not a formula for winning games against SEC opponents that have quarterbacks who can move. However, before turning this into a pile-on-Auburn segment, we also have to point out the positives. Peyton Barber is running the football effectively, going for 115 yards in the Louisville game and again getting 100-plus as one of the few bright spots against Jacksonville State. 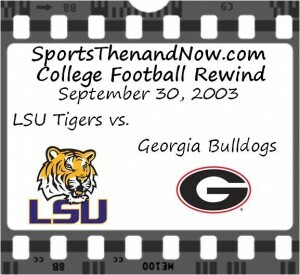 On September 20, 2003, the #7 ranked Georgia Bulldogs traveled to Baton Rouge to take on the #11 LSU Tigers in an early SEC showdown. The Bulldogs were the defending SEC champions as they ended a 20-year drought of not winning the SEC title, thanks to head coach Mark Richt, quarterback David Greene, and SEC player of the year, defensive end David Pollack. Greene, Pollack, and several other key starters returned for the 2003 season and helped led Georgia to wins in their first three games of the season. Even though they would be playing in one of the toughest environments in all of college football, the Dawgs were confident as they had won all nine games played in opponents’ home stadiums since Richt became the coach in 2001. LSU also entered the game with a 3-0 record as they had won those three games by a combined score of 143-27. The Tigers were led by head coach Nick Saban, who had LSU to a surprising SEC championship in 2001 and was in his fourth season in Baton Rouge. 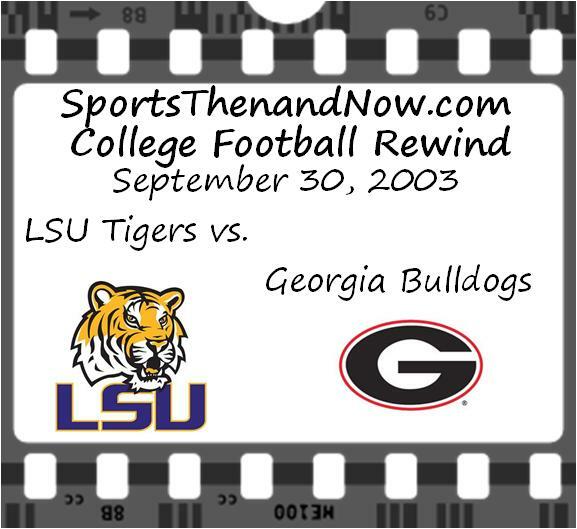 LSU was looking to rebound in 2003 following a late-season collapse in 2002 in which the Tigers dropped five of their last six games to lose their grip on the SEC Western Division title and finish the season with an 8-5 record. The main reason for that collapse was the loss of starting quarterback Matt Mauck, who broke his foot in the sixth game of the season and was lost for the rest of the season. Mauck had become a folk hero in the eyes of LSU fans as he had come off the bench to lead the Tigers to a 31-20 upset over Tennessee in the SEC Championship Game. 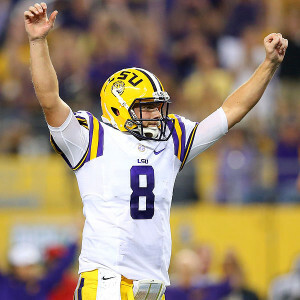 Mauck returned to Baton Rouge for his senior season and was at the helm as the Tigers faced off with Georgia in what turned out to be a preview of that year’s SEC Championship Game. Both teams traded punts until the Dawgs drove to the LSU 16-yard-line where they had to settle for a 33-yard field goal by Billy Bennett to give Georgia a 3-0 lead with 6:20 left in the first quarter. On the Tigers’ ensuing possession, Mauck was picked off by Georgia safety Sean Jones, to give the Dawgs the ball at the LSU 40-yard-line. Two runs by running back Michael Cooper gained 22 yards and the Dawgs were in prime position to expand their lead as they had a 1st-and-10 at the Tigers’ 18-yard-line. 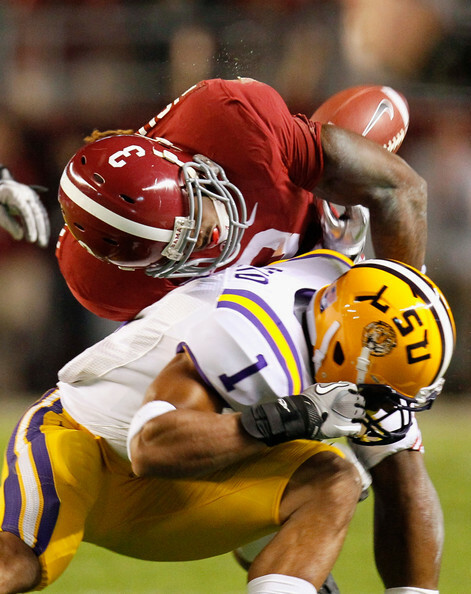 This Saturday, #1 LSU travels to Tuscaloosa to face off with #2 Alabama in the latest “Game of the Century”. This showdown between the Tigers and the Crimson Tide is the latest chapter in a SEC rivalry where the intensity has risen since Nick Saban became the head coach at Alabama. From 2000-2004, Saban was the head coach at LSU where he compiled a 48-16 record, won two SEC Championships, and the 2003 BCS National Championship in his five seasons at Baton Rouge. Saban left LSU following the 2004 season to become the head coach of the NFL’s Miami Dolphins while Les Miles moved from Oklahoma State to become the LSU head coach. During the next two years, Miles would lead LSU to back-to-back 11-win seasons while Saban would struggle in Miami as he compiled a 15-17 record during that same time. Almost immediately after the 2006 NFL season ended, Saban left Miami to become the Tide’s head coach, which in the minds of LSU fans was seen as an act of betrayal since ‘Bama played in the same division as LSU, the SEC West. 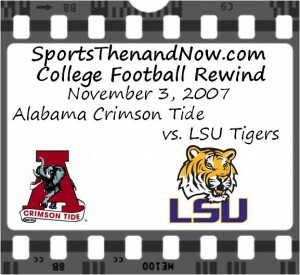 So when ‘Bama hosted LSU on the first Saturday in November 2007, it was an emotionally-charged game for the Tigers as the fan base demanded a victory over Saban and the Tide.